Helen Edwards is Assistant Dean, International and Engagement, at Queensland University of Technology, Australia, and a member of the Institute of Health and Biomedical Innovation. Helen was a Program Leader for the Australian Wound Management Innovation Cooperative Research Centre and led the Clinical Application program. She has worked in education and research for 35 years and was the Head of School of Nursing at QUT for 16 years. Helen is internationally recognised for her work in ageing, chronic disease and wound management. Helen has been an editor for 4 editions of a medical surgical textbook and has published over 115 articles and book chapters. 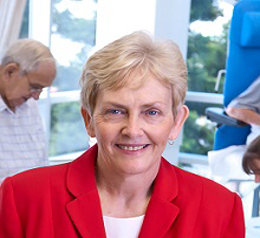 Since 2005 she has secured $40M AUD of research funding from national and international funding sources. Helen has supervised 14 higher degree students to completion.